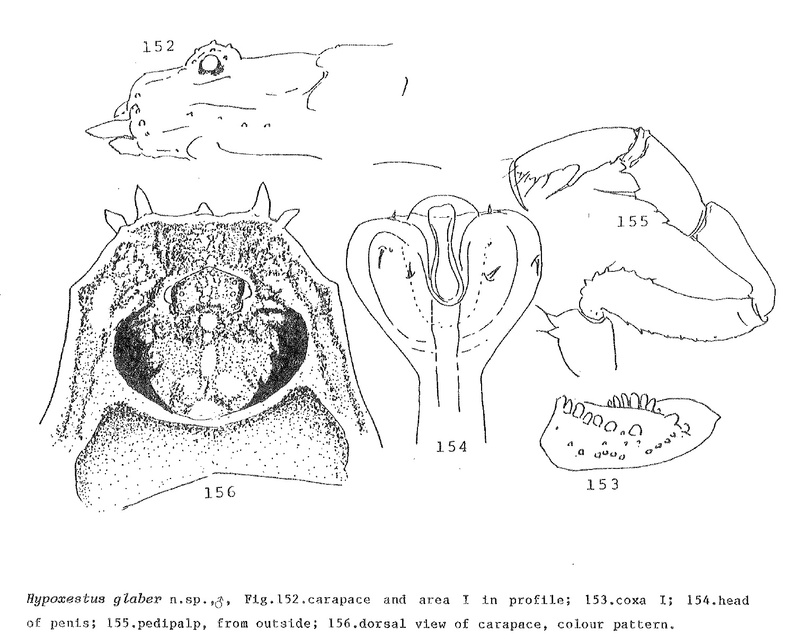 Diagnostic features of Hypoxestus glaber, from Kauri (1985). The Hypoxestinae are a group of assamiid harvestmen found in Africa and Asia (Santos & Prieto 2010). 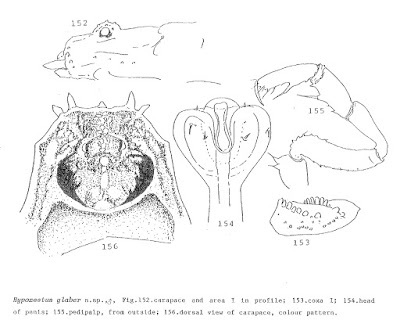 Characters (from Santos & Prieto 2010): Anterior margin of carapace unarmed; spiracles visible, unprotected; femur of pedipalp with short ventral teeth; distitarsus I two-segmented; metatarsus II undivided; tarsi III and IV with smooth claws. [SG11] Sharma, P. P., & G. Giribet. 2011. The evolutionary and biogeographic history of the armoured harvestmen—Laniatores phylogeny based on ten molecular markers, with the description of two new families of Opiliones (Arachnida). Invertebrate Systematics 25: 106–142. [S78] Suzuki, S. 1978. Three harvestmen (Arachnida, Opiliones) from the Bonin Islands. Annotationes Zoologicae Japonenses 51 (3): 179–185.